Winter is slowly creeping by and the snow, rain, freeze, thaw, keeps repeating. It is only natural to want to stay in, but if you’re looking for an excuse to get out of the house, may we suggest The Overcast’s 2019 Burger Battle? The Racket spoke with The Overcast’s editor Chad Pelley via email about the media outlet’s annual St. John’s event. This year, 21 restaurants have entered 21 burgers into the Battle and will be served throughout the month of February only. “They're all special, one of a kind, get 'em before they're gone burgers,” said Pelley though sometimes restaurants like Magnum & Steins, Seto, and Bernard Stanley's bring back previous offerings from time to time as specials. The Overcast will send two food writers around to try all 21 burgers and award one the Critic's Pick. There is also a poll on their website to crown a People's Pick. Every year, the Burger Battle offers something for everyone including moose burgers, lamb burgers, and veggie burgers packed between various types of buns, and featuring various combinations of condiments and toppings. “Every year, I'm just blown away by the diversity of burgers our local chefs come up with. These are definitely not the kinds of burgers you'd make up yourself at home,” said Pelley who is particularly interested in trying Blue on Water’s Thai Fighter Burger. Choosing which restaurants to participate can be hard. “No one should eat a burger every day, and most people can't afford to dine out every day, so we cap the burgers at [around] 20.” Said Pelley. The Overcast puts out a call and curates a list that offers a great range of burgers. They also aim to represent different sorts of food establishments like pubs, fine dining, and food trucks. “There's also a real focus on only asking truly local restaurants, and favouring ones that make everything in house, using real ingredients/food. Burgers you can feel good about eating, I mean,” added Pelley. 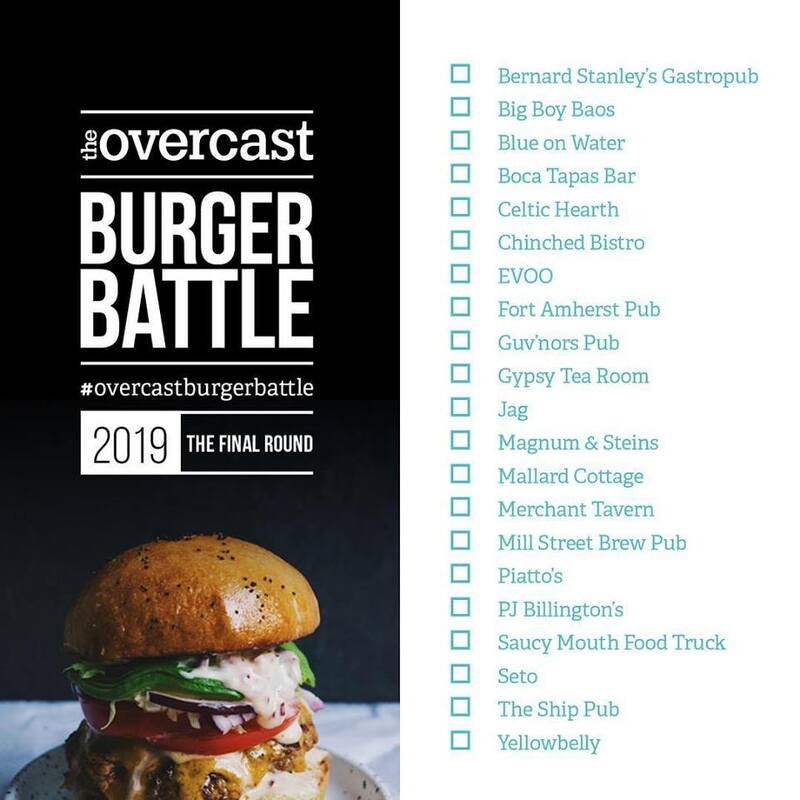 This is The Overcast’s fourth Burger Battle and according to Pelley, it yields a lot of interest from restaurants and the general public. He thinks this has to do with chefs wanting to prove that the burger is so versatile, and readers eat up the challenge because burgers are great comfort food for the middle of winter. For Pelley, the perfect burger consists of three things. First, it has to be worth leaving the house and paying for, and something not easily replicated at home. Second, there’s the balance of flavour; Pelley doesn’t like a “one-dimensional” burger but doesn’t want it overwhelmed by one particular taste. “You can generally tell how much thought a chef put into their burger by assessing balance, and the number of flavours coming through, without being so complicated they get in each other's way,” he said. Finally, the perfect burger needs the perfect side. Pelley believes you can’t go wrong with fries, but is also open to a salad, or something like the pickled red onion rings that EVOO is offering with their Double Beyond Meat Veggie Burger. Pelley isn’t one of The Overcast’s burger critics though. This year contributors Emily Deming and Michael Hannaford will be rating the burgers. Apparently they disagree on everything about what makes the perfect burger except for one thing. “[That is] "Structural integrity." In other words, is the burger going to fall apart in your hands, or will the bun hold it all together? They don't like a burger that's falling apart as they eat it. You know the type: we've all started eating a burger we couldn't put down, because it was coming apart so bad you know you won't be able to pick it back up if you put it down,” said Pelley. The 2019 Burger Battle is being advertised as “The Final Round” which might come as a surprise considering the popularity of the event. Pelley promised that there is a reason for this and that all will be revealed on Monday. If you plan on taking part in the Burger Battle, you can post your photos on social media using the hashtag, #OvercastBurgerBattle. (Note that “Overcast” needs to be in your hashtag). The Overcast also has provided a checklist of all the participating restaurants as well as a complete description of each burger and the prices for each. It might also come as a treat to know that about half the participating restaurants will be offering $5 pints of Quidi Vidi in order to wash down your burger. Don’t forget to vote for your favourite burger! And stay tuned to The Racket as we will be writing about the burgers we tried throughout the month!